It often starts with a phone call, "We have a cow going down the street!" The absent without official leave critter is never good, never easy and numerous lessons are learned, sometimes the hard way. History has some very valuable lessons and some future wrecks can be prevented with some basic planning. 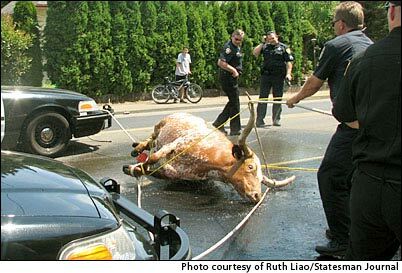 Longhorns departing a trailer aren't always this fortunate to have a policeman who can handle a well rope. This Oregon escapade had a good ending, yet there were confinement lessons learned too late by the owner. 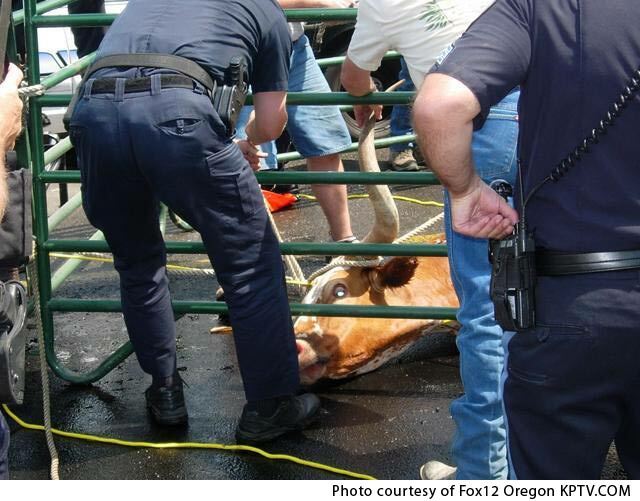 During the Marion County Fair in Salem, Oregon the cow "Pastel" had TV cameras, and media scampering like an O. J. sighting. She slipped by the trailer gate near a light weight corral panel and off she went. Pastel had the fire department, police and her owner Daniel Fey of Yarnhill, Oregon running in circles like a Three Stooges special feature. In just over an hour a buckaroo emergency responder saved the day with an accurate loop, then another loop, then another loop and finally the capture was completed. With contemporary animal rights concern about the "poor" animal over heating, fire trucks were dispatched and high pressure nozzles blasted her with a tanker of water to cool her down. Pastel was entered in the Northwest Longhorn Association show, but due to her dastardly escape attempt she was required to pass up the annual show. Pastel's owner was very fortunate that he still owns his cow. Police protocol is fairly consistent to dispatch "shoot" any uncontrolled animal that could possibly be a public danger. Fortunately someone had a rope and knew how to handle it. Had this been on the eastern side of the USA this saga could have very easily ended much more unpleasant. Pleasant memories can be planned in advance. Cattle are like grand kids and often perform at their worst when away from home. Special precautions must be a part of any livestock handling effort. Every show animal has their first show. This can be the unpredictable time for a critter to try something. Lets look at some ways to plan for happy times and safety while handling cattle. Once cattle are inside a trailer they need to stay there until a secure corral or pasture is available. The pioneer Longhorn producer Frank Doherty had a load of cattle released from his trailer while parked at a restaurant in Kansas. What Frank thought was going to be a leisurely trip back to the ranch turned into a lifetime adventure which took two days to locate and reload the cattle. Unfortunately there are people who have a twisted psyche; people who like to create a detonation; inebriated people who think the trailer end gate is the court house elevator. You know the type? To safely move, haul, show and handle even very gentle cattle requires some basic planning. Probably the most important and simplest thing to do when hauling stock is to chain the trailer doors closed. Terry Kelsey, the famous artist who created the huge Texas Gold monument in Fort Worth once looked in his rear view mirror and saw cattle jumping out the side door of his trailer, landing in the road side ditch at a high speed. His escape door handle had broken and all the cows dived out. Finish reading this article, then go purchase a good sized chain and a good sized lock for your trailer rear gate. If you have a sliding gate wrap the chain completely around the whole sliding gate and the corner of the trailer. Get a similar chain and lock for the escape door. Don't trust the latches. When feeding cattle on the road, don't open the trailer door. Toss the hay in through the trailer slats. Carry a good nylon rope in every livestock hauling truck. It helps if you know how to rope something with it, but have one anyway. Light weight cattle panels teach cattle that they can escape under these temporary corrals. Panels need to be secured to stable posts or solid structures as a precaution. Before a trip always check the trailer hitch, breaks, tire air pressure, trailer lights, valid license plate and look under the trailer every once in a while. Look for broken electrical wires, slipper springs out of kilter, and damage to any working parts. When cattle are at shows or fairs there should be a boundary fence around the facility. A safety neck rope is always important. Make sure cattle are tied twice. No one wants to have their registered cattle "dispatched" by a serious law enforcement person. But, on the other hand, put your family in a car and be driving along at 60 MPH when a large animal jumps in front of your vehicle. Your first phone call, if you are able, may be to your attorney. That is the other way to look at it. At some point, dispatch is good. Safety is about responsibility and intelligent planning. Now, quit messing around---------go buy those chains.